For our service, At the Crux of the Matter, the scripture reading was a composite of texts. I begin this post with those texts, followed by the short meditation that I wrote for that service. And God saw the light was good. and drippings from the honeycomb. he commanded and it stood firm. 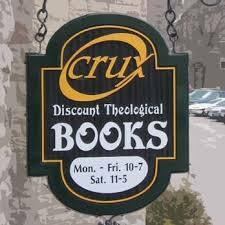 A meditation on the closing of Crux Books. saturating all things with that love. The Word of the Creator did not return empty. And the Word gave birth to more words. words of truth and justice, of compassion and mercy. Sweet words, words to enlighten our paths. in the face of lies. gave birth to a whole library of books. And these words, too, do not return empty. The Word of creation is for creation. The Word of promise must be fulfilled. The storied Word was always on the path of incarnation. we beheld his glory and grace. and returned in resurrection power. Cindy and Ed Hayley know a lot about words. And they know that not all words are created equal. Some words deceive and abuse. and other words are idols themselves. It is true enough, dear friends, that we are people of the Word. all human behaviour is rooted in words. The question is which ones? Which words can give us vision beyond the range of normal sight? Which word is a word of profound and radical regeneration? a word worthy of the One who is the Word made flesh? Cindy knows the answer to this question. nothing less than the fruit of the Spirit. they bear in every dimension of our lives. has been a steward of the Word in our midst. to be a ministry of the Word. nothing less than the fruit of the Spirit in our midst. And for that, we are deeply, deeply grateful.